The pipeline that leaked thousands of gallons of oil into the waters off California earlier this week did not have an automatic shut-off valve, a Santa Barbara county official said Sunday. On Saturday, rough weather and high winds complicated efforts to clean up the spill. The oil slick thinner than a coat of paint that covers 10 square miles off the coast of Santa Barbara was becoming harder to skim from rough waters, officials said, as more dead animals were discovered in the muck. On Friday, five petroleum-soaked dead pelicans were recovered from the coastline along with a dolphin carcass with no oil on it that had washed ashore in Santa Barbara Harbor, Reuters reported. An animal autopsy will be performed to determine if they are victims of the spill. Since Tuesday, up to 101,000 gallons of crude oil has spilled into Refugio State Beach from an underground pipeline owned by Plains All American Pipeline. The pipeline runs parallel to the coastal highway. The spill, which is the worst in the area since 1969, is being investigated by federal, state and local prosecutors for possible violations of federal and state law, the Associated press reported. On Wednesday, California Gov. Jerry Brown declared a state of emergency for the Santa Barbara County coast, closing fisheries in an area that stretches 23 miles long and 7 miles wide and banning the use of Refugio State Beach. The ban has put a strain on people who look to the fisheries as a source of livelihood. 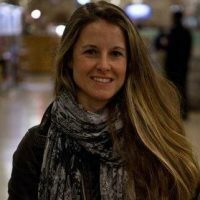 Stephanie Mutz, who makes a living plucking sea urchins from the Santa Barbara coast and selling them to upscale restaurants in Southern California, said she would have to look for alternative hunting grounds. “That was one of my predominant fishing spots, so I just have to think of a Plan B,” Mutz told Reuters. 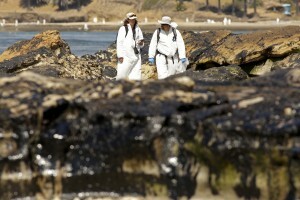 Left: Crew members inspect the oil spill damage at Refugio State Beach in Goleta, California May 22, 2015. Bad weather has hindered cleanup efforts, officials said Saturday. Credit: Jonathan Alcorn/REUTERS.